Foot anatomy plays an important role in foot function. For example, do you know how many arches each foot has? If you answered one, you answered like 95 percent of people do – incorrectly. Each foot actually has three arches: one on the inside of the foot, one on the outside and one across the ball of the foot. 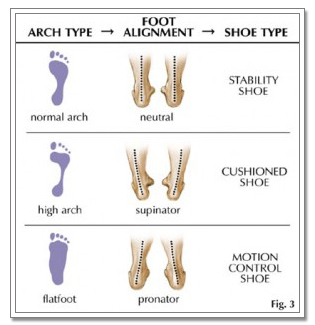 These arches are all important and must all be functioning properly to facilitate healthy movement and weight-bearing. Excessive Supination: If your arches are too high or over-supported, we call this “excessive supination.” People who excessively supinate have trouble wearing certain shoes that are too tight because they create pressure on the top of the foot and the ball of the foot. Excessive supination occurs in about 3 percent of the world’s population. Excessive Pronation: A more common occurrence is something called “excessive pronation,” which means the arches actually fall toward the floor or flatten out. If you look at most people’s feet, you will see this happening. Let’s think about the concept of an overly-pronated foot for a second. Stand up and make your feet fall or collapse inward by rolling your feet toward one another. Do you feel the stress on your body? Keep your feet collapsed and close your eyes. Feel the strain on the inside of your ankles, the inside of your knees, the outside of your hips and possibly into your lower back? The stress moves up through your spine to the shoulders, the neck and the head. There are many painful conditions related to your arches collapsing and your feet excessively pronating, including bunions, corns, callouses and toes that stick up or off to the side. Other conditions: More serious conditions attributable to foot dysfunction include plantar fascitis (inflammation of the thick tissue on the bottom of the heel), Achilles tendinitis (inflammation of the Achilles tendon), Morton’s neuroma (thickening of nerve tissue between the third and fourth toes, causing sharp pain on the ball of the foot), anterior cruciate ligament (ACL) tears, arthritis, and hip and lower back pain. These conditions usually create even more pain than excessive supination/pronation and can seriously affect someone’s health and quality of life. They are often the reasons why people consult doctors for help. Genetics: You cannot outrun your genes. Flat feet or excessively pronating feet run in families. Parents pass it on to their children. 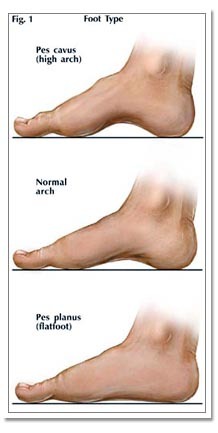 If one parent has flat or collapsed arches, their children will have it also to some degree. If both parents have overpronated feet, their kids will absolutely have flat feet as well. I check children for this around age 7. You can bring your shoes into our office so we can look at them for you. It is too difficult to list the “good shoes” for you because the best brand or type for you varies based on your feet and your lifestyle. As experienced chiropractors in Augusta GA, Georgia Clinic of Chiropractic is is able to provide chiropractic treatments directly to your foot, providing you with a great option to finally taking care of those foot problems. This article was contributed by Dr. Kevin Wong, an instructor for Foot Levelers, Inc.
Georgia Clinic of Chiropractic successfully treats a wide range of conditions, from plantar fasciitis to tendonitis. Georgia Clinic of Chiropractic is one of the few clinics in the Augusta area certified to treat extremities, such as a knee, ankle, or wrist, using the most widely researched protocol in the chiropractic industry, the Activator Protocol. Click here to watch the story of a local Augusta athlete and how they incorporated their chiropractic care into their training regimen. Augusta GA Chiropractor Georgia Clinic of Chiropractic provides customized chiropractic treatments to the Augusta GA, Martinez GA, and Evans GA communities. Visit our main website at www.georgia-clinic.com for customized chiropractic in Augusta GA.